MARIE KONDO is a professional cleaning consultant with a three-month waiting list. Inspired by the Japanese book Throw-Out Skills and a lifelong love of all things house and home, she began her study of the art of cleaning, established her consulting business, and founded the KonMari Method. Her courses, "Lessons on Organization and Storage for Women" and "Lessons on Organization and Storage for Company Presidents", have many dedicated fans. Her previous book, The Life-Changing Magic of Tidying Up, is a #1 New York Times bestseller and has become a worldwide sensation. From the Audiobook Download edition. ". . . the organization expert who dazzled the world with her Life-Changing Magic of Tidying Up is back with more spirit-rousing advice." 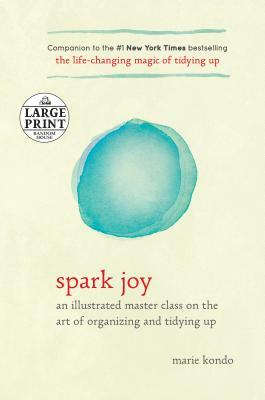 "If the first book was merely an introduction to Kondo’s radical philosophy, known as the KonMari method, the new one goes deep into the details . . . the result is inescapable: a home, and a vision of life, that truly sparks joy." "If you wanted more from her first book, this is what you've been waiting for." "In her new organizational how-to book, Kondo's mission is to help us identify what brings joy while simultaneously cultivating more of it." "I'm an evangelist for Marie Kondo, the Japanese organizational guru whose unique tidying techniques have become a worldwide sensation. I've read both of her books and completed the full decluttering/reorganizing program in six months. In the last year, it has been my favorite thing to bring up to my friends, co-workers, heck, even distant cousins. I am obsessed, because it really has transformed my living space and shattered many of my bad habits related to tidying." "Kondo’s way of anthropomorphizing belongings and paying them the respect of taking them out of the closet for a proper dismissal makes a big difference. . . . consider me a Konvert." "From the perfect underwear drawer, to how to store socks, Marie Kondo is helping the world to properly (and lovingly) store their most beloved possessions, one fold at a time." "Ms. Kondo delivers her tidy manifesto like a kind of Zen nanny, both hortatory and animistic." ". . . a literal how-to-heave-ho, and I recommend it for anyone who struggles with the material excess of living in a privileged society. (Thanks to Ms. Kondo, I kiss my old socks goodbye.) ... To show you how serious my respect for Ms. Kondo is: if I ever get a tattoo, it will say, Spark Joy!" "This book is a cult. A totally reasonable, scary cult that works, doesn’t kill people (a bonus), but does drastically change your life. In this case — for the better." "Reading it, you glimpse a glittering mental freedom from the unread/uncrafted/unworn, buyer’s remorse, the nervous eyeing of real estate listings. Life’s overwhelm, conquered." "I can only describe the way I felt afterward as an organizational high. I had a sense of being more in control of my life than I ever had before, which inspired me to maintain the order in the months that followed. Not bad for a Sunday afternoon."